Inspired by the highly symmetrical and optimised physical properties of a triply periodic minimal surface, ‘Minimal Matters’ aims to create an explorative, meditative and interactive experience for visitors. 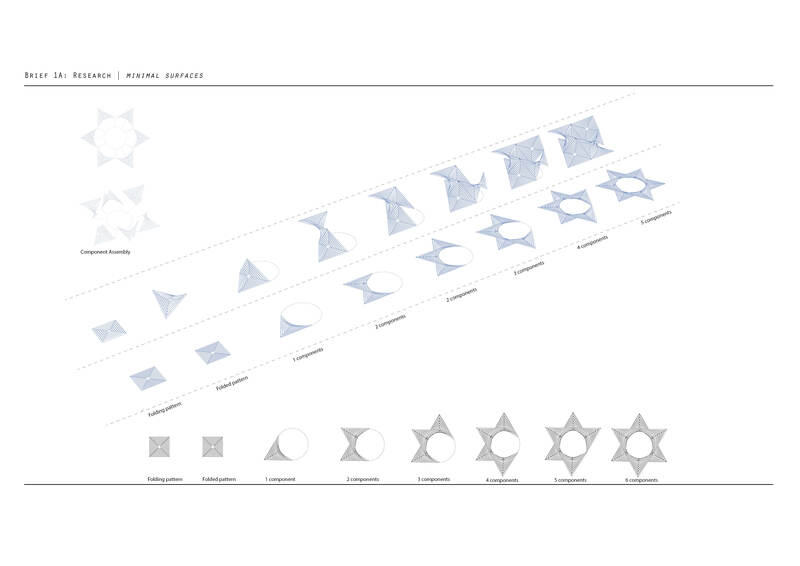 It is a strained grid shell utilising the geometrical benefits of an asymptotic curve network; digitally designed via algorithmic rules to minimise material, cost, and construction time. 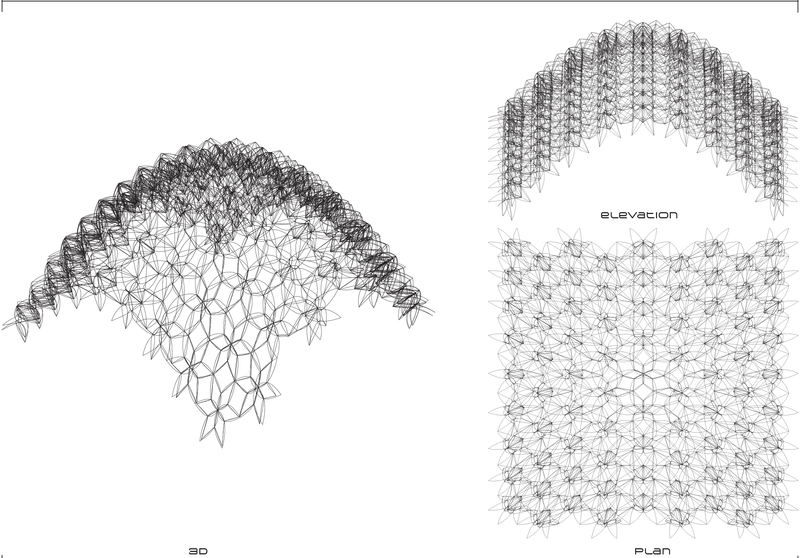 The proposal takes the form of a crystalline structure found in nature, interpreted through parametric design into a timber grid art piece. 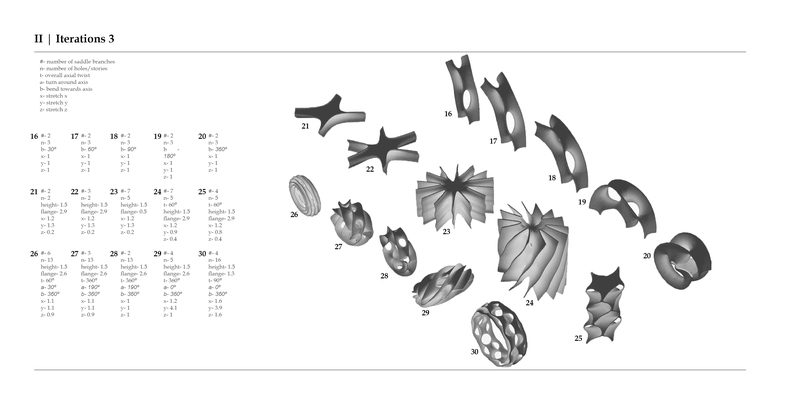 In the sense of repeating themselves in three dimensions, a gyroid is an infinitely connected triply periodic minimal surface. 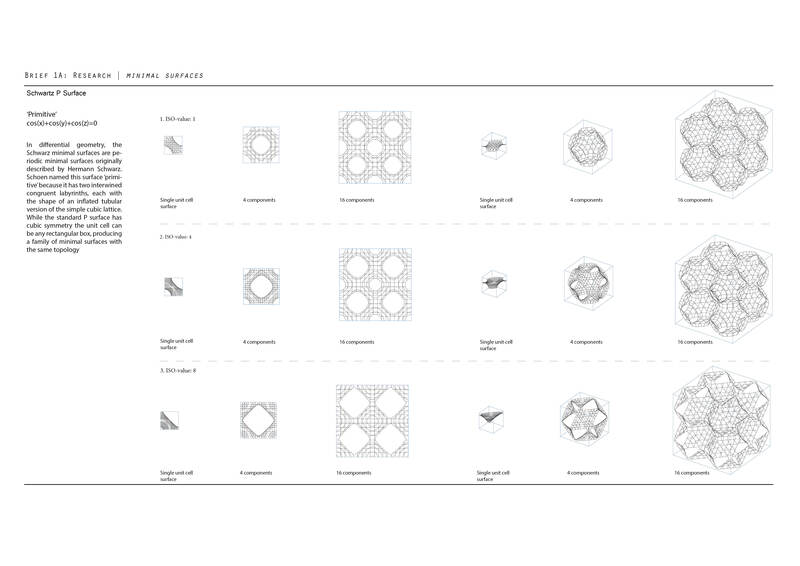 A minimal surface is a single surface articulation which minimises that amount of surface needed to occupy space. 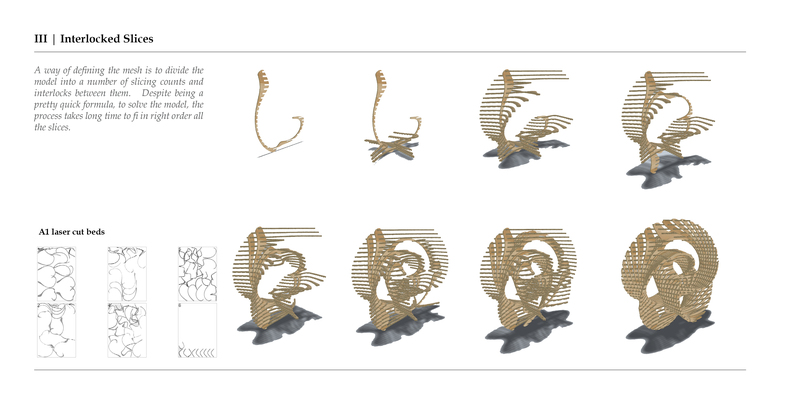 The proposal represents restoring a balance in energy, taking only that of the earth’s resources required to fulfil the form. Our inability to distinguish our needs from our greeds leads to excessive desires for life’s commodities. 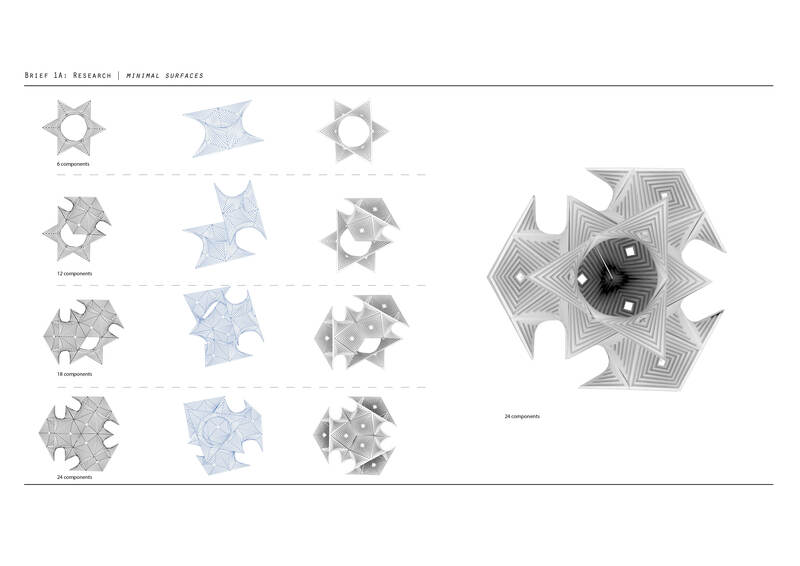 The efficiency of the design complements the beauty of rotational symmetry of a single node. The lattice structure will create foot and hand holds to help climbers onto the series of sloping platforms; allowing users to survey the desert camp from different perspectives. More than just a climbable structure, Minimal Matters is to be a resting place for festival-goers and a shelter from the strong sun of the site. The layers of grids cast shadows of varied patterns throughout the day. 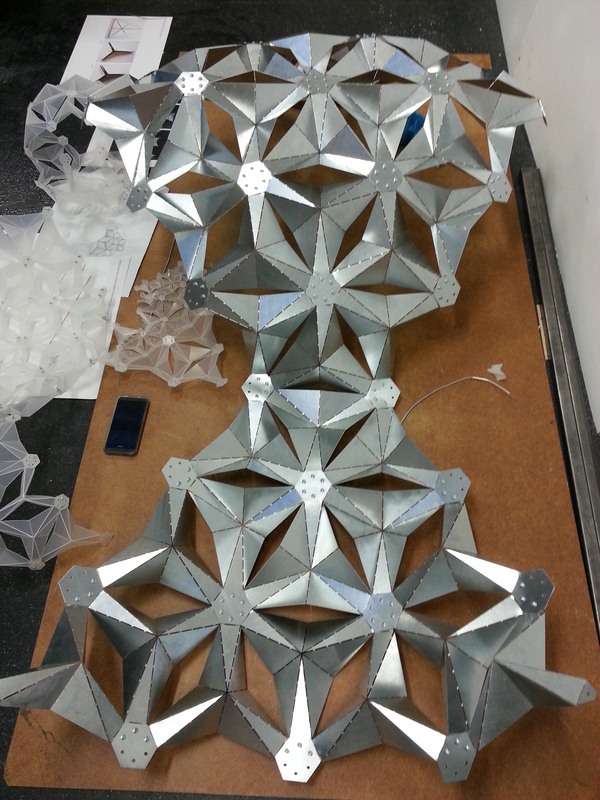 At night, LED lighting along the lamellas will celebrate it’s form and illuminate the playa. 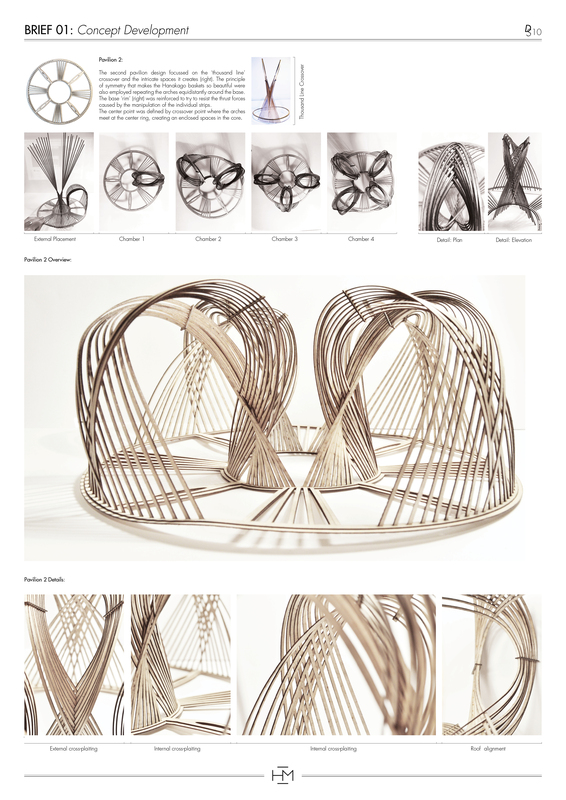 Inspired by nature, the proposal brings a parametrically designed structure into the realm of physical interaction. 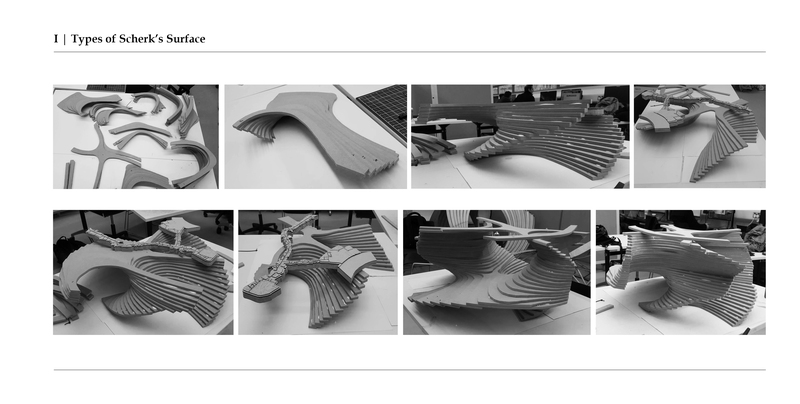 The piece is a culmination of thorough research and physical exploration of timber’s potential. 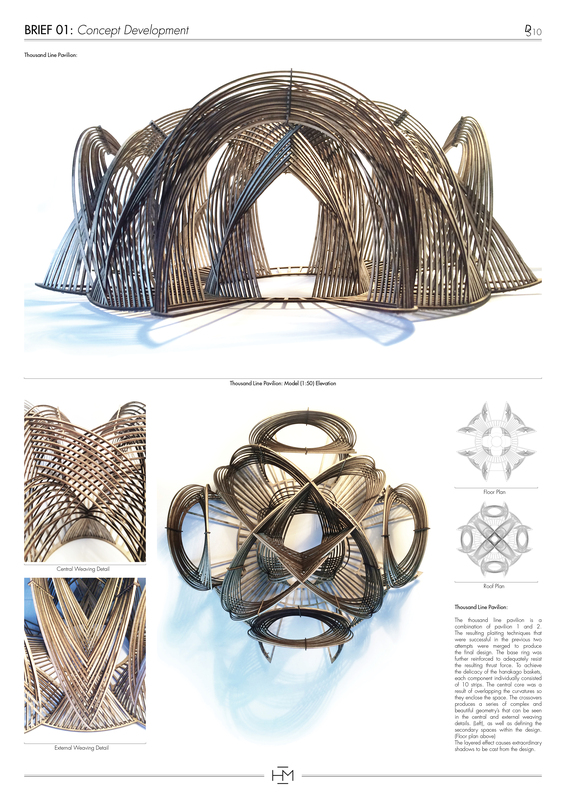 The combination of conceptual bravery matched with architectural reality seeks an architecture of playfulness and beauty which will respond to the inclusive environment of Burning Man. 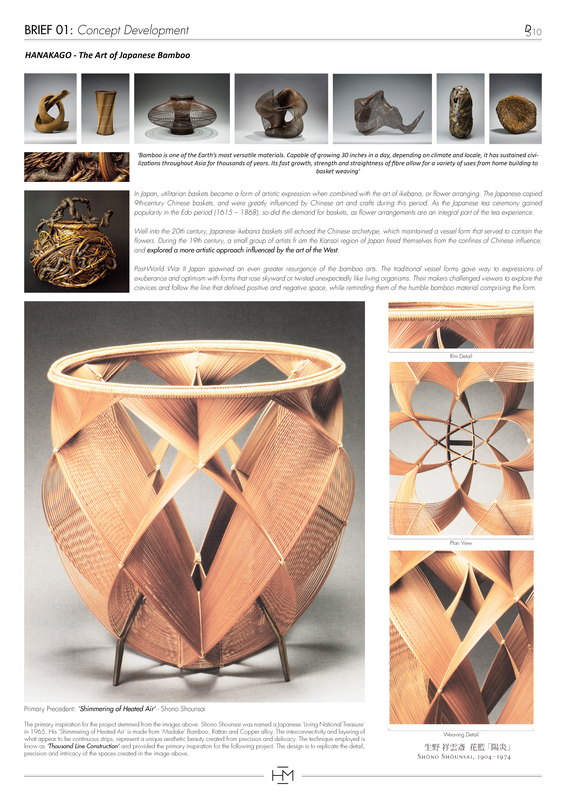 It will celebrate a new design method for timber grid construction, and symbolise the harmony between nature and computational design. A minimal surface is the surface of minimal area between any given boundaries. In nature such shapes result from an equilibrium of homogeneous tension, e.g. in a soap film. 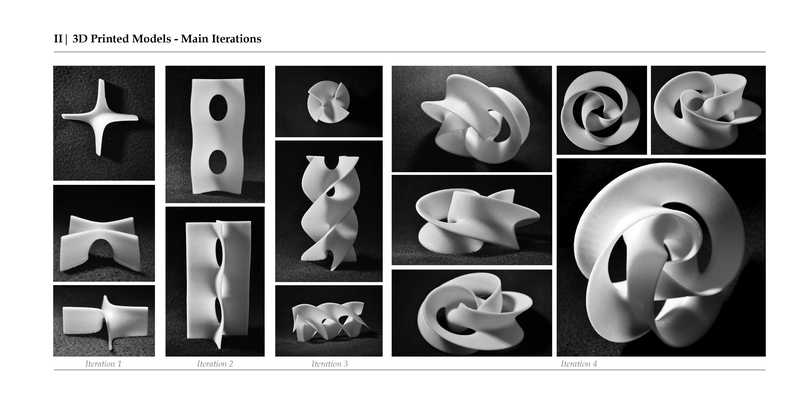 Minimal surfaces have a constant mean curvature of zero, i.e. the sum of the principal curvatures at each point is zero. 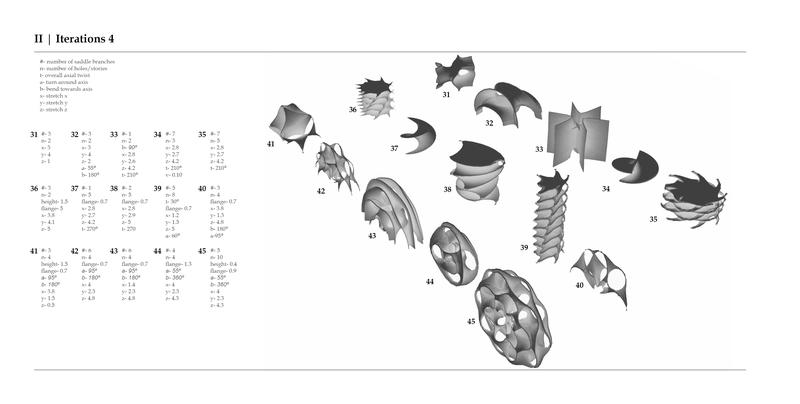 Particularly fascinating are minimal surfaces that have a crystalline structure, in the sense of repeating themselves in three dimensions, in other words being triply periodic. 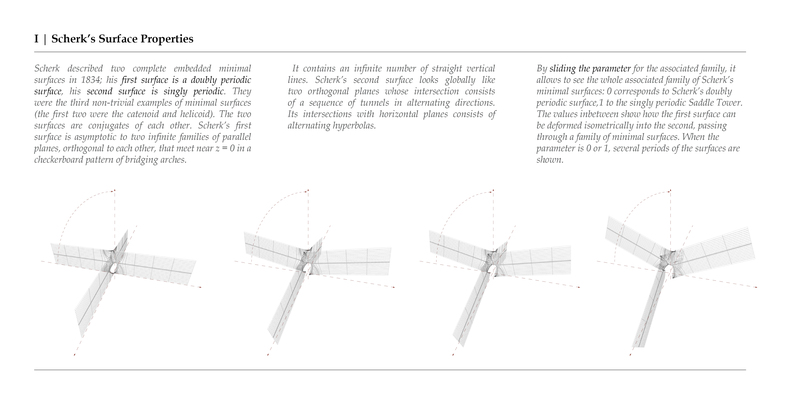 Many triply periodic minimal surfaces are known. 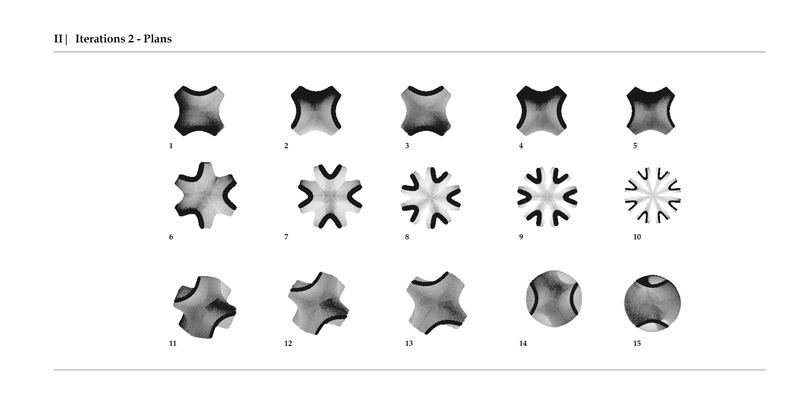 The first examples of TPMS were the surfaces described by Schwarz in 1865, followed by a surface described by his student Neovius in 1883. In 1970 Alan Schoen, a then NASA scientist, described 12 more TPMS, and in 1989 H. Karcher proved their existence. 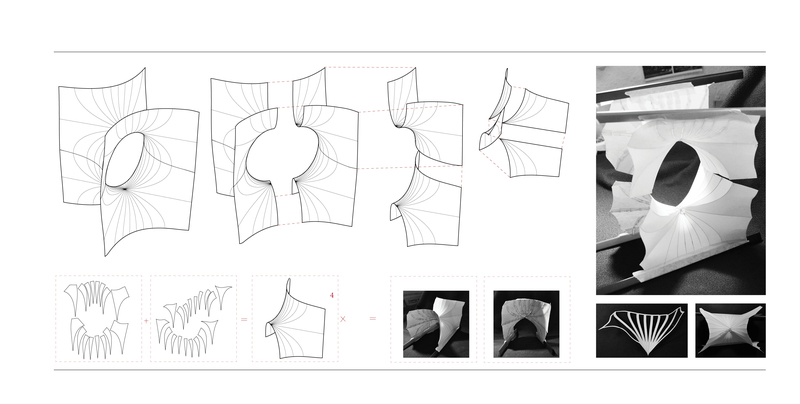 My research into grid structures with the goal of simplifying fabrication through repetitive elements prompted an exploration of TPMS. 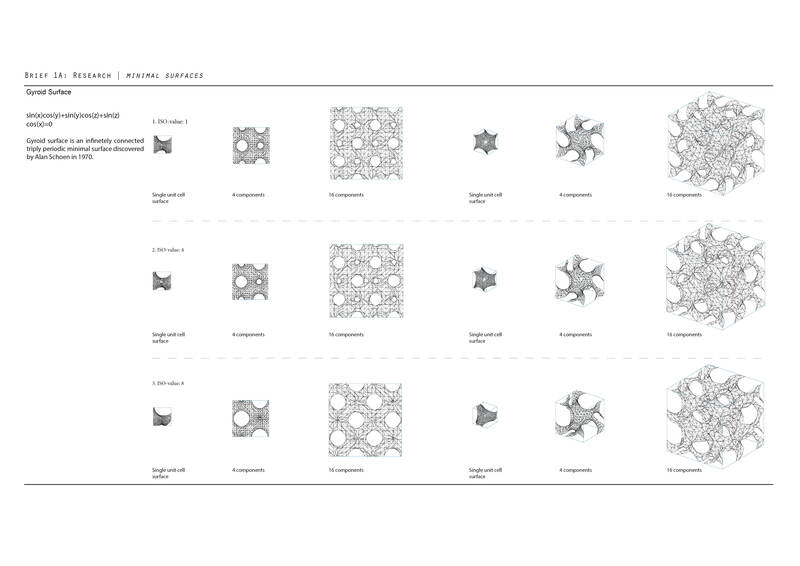 The highly symmetrical and optimised physical properties of a TPMS, in particular the Gyroid surface, inspired my studio proposal, Minimal Matters. 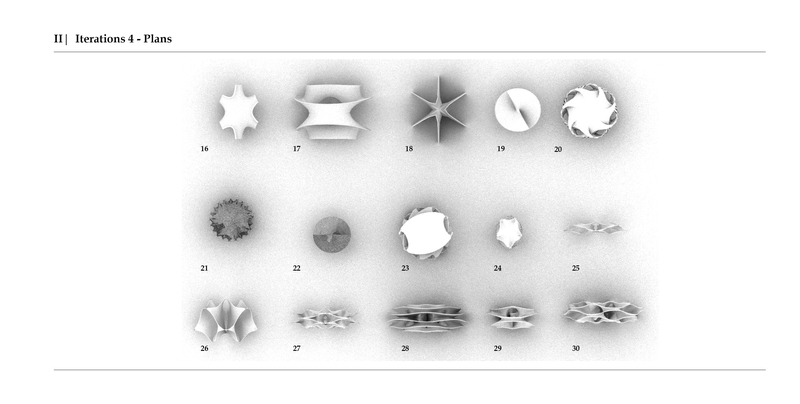 The gyroid is an infinitely connected periodic minimal surface discovered by Schoen in 1970. 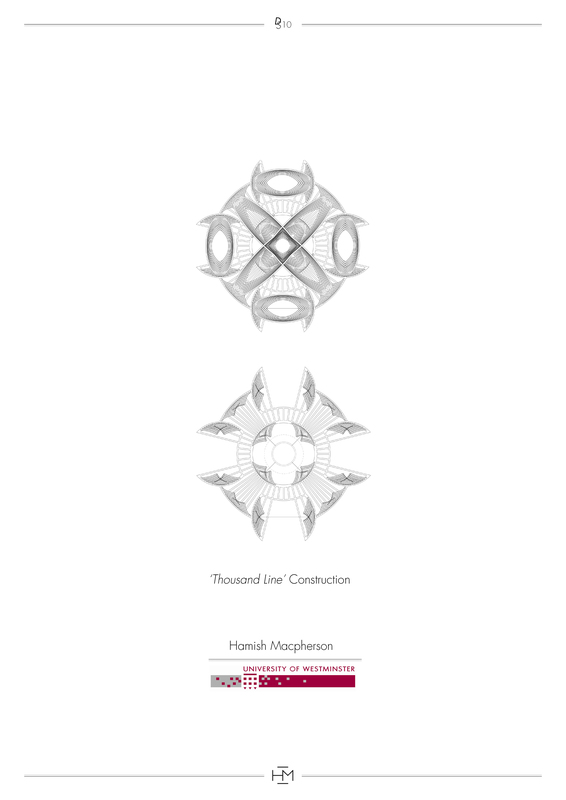 It has three-fold rotational symmetry but no embedded straight lines or mirror symmetries. The boundary of the surface patch is based on the six faces of a cube. Eight of the surface patch forms the cubic unit cell of a Gyroid. For every patch formed by the six edges, only three of them is connected with the surrounding patches. 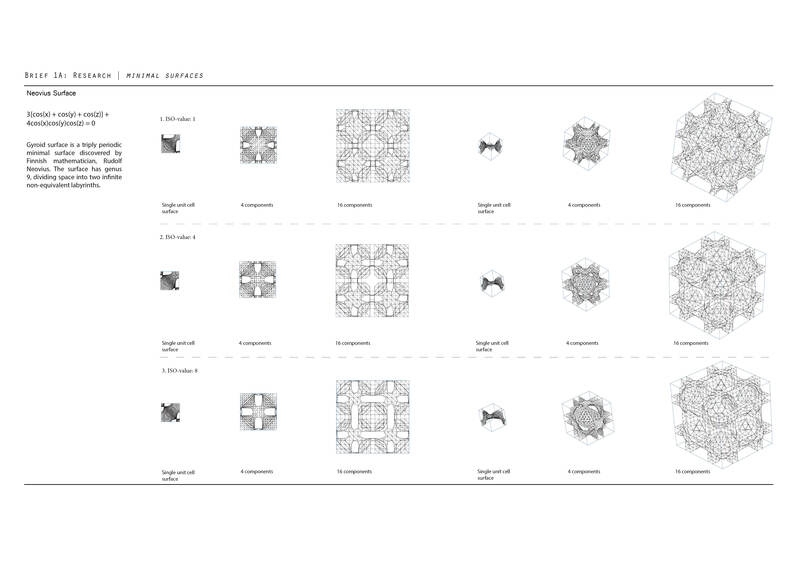 Note that the cube faces are not symmetry planes. There is a C3 symmetry axis along the cube diagonal from the upper right corner when repeating the cubic unit cell. Using Grasshopper and the ‘Iso Surface’ component of Millipede, many TPMS can be generated by finding the result of it’s implicit equation. 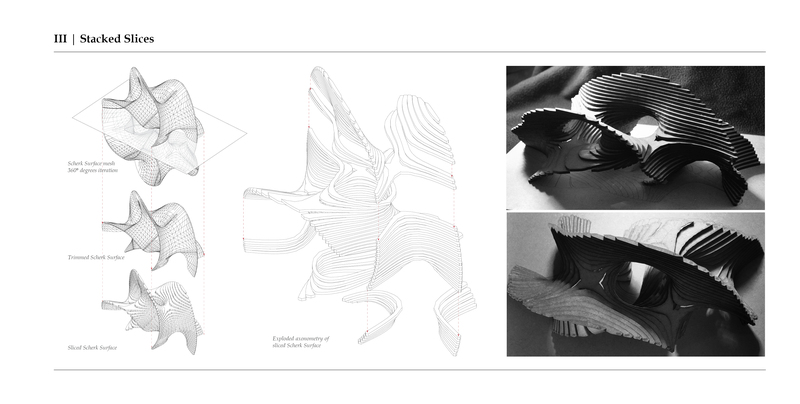 Standard F(x,y,z) functions of minimal surfaces are defined to determine the shapes within a bounding box. The resulting points form a mesh that describes the geometry. A cube of points are constructed via a domain and fed into a function. 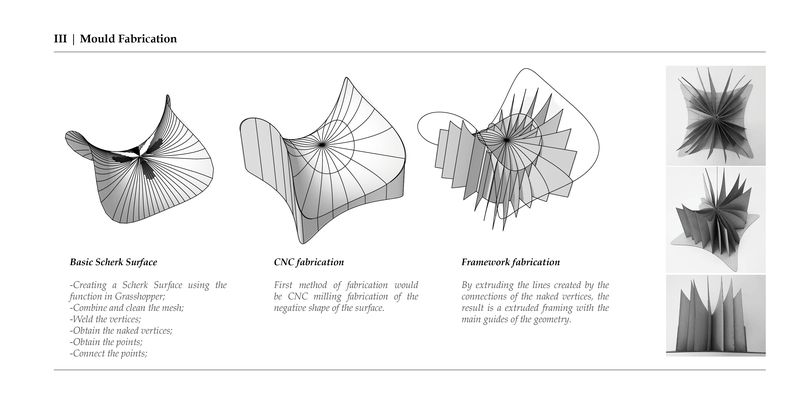 Inputs of standard minimal surfaces are used as the equation. The resulting function values are plugged into Millipede’s Isosurface component. 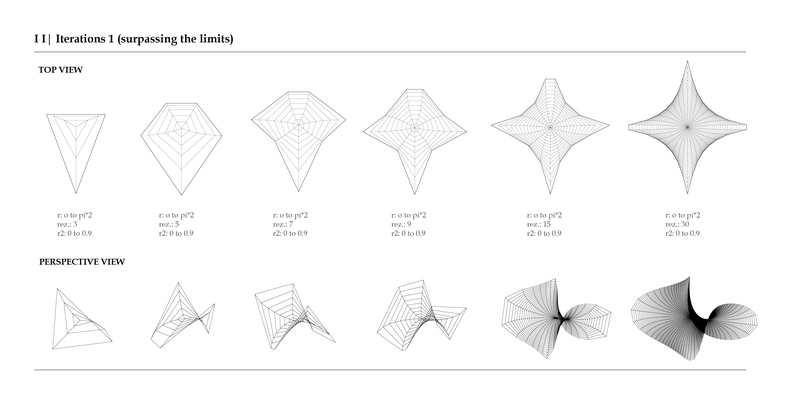 The bounding box sets up the restrictions for the geometry. 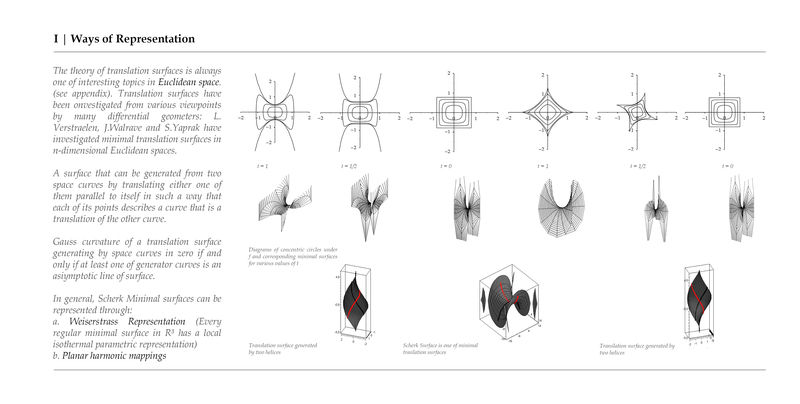 Xres, Yres, Zres [Integer]: The resolution of the three dimensional grid. 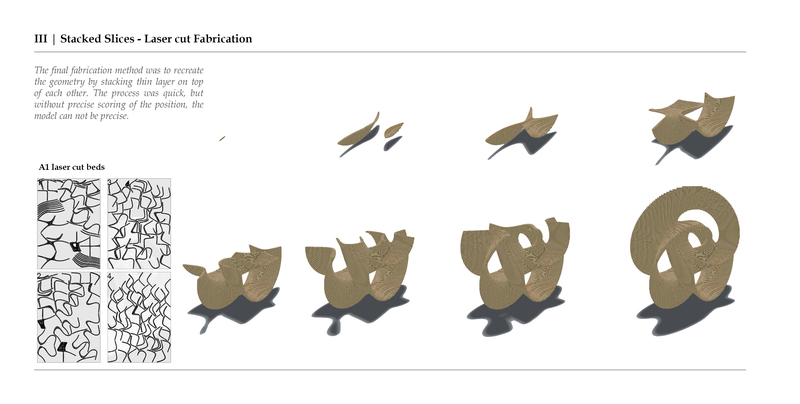 Isovalue: The ‘IsoValue’ input generates the surface in shells, with zero being the outermost shell, and moving inward. 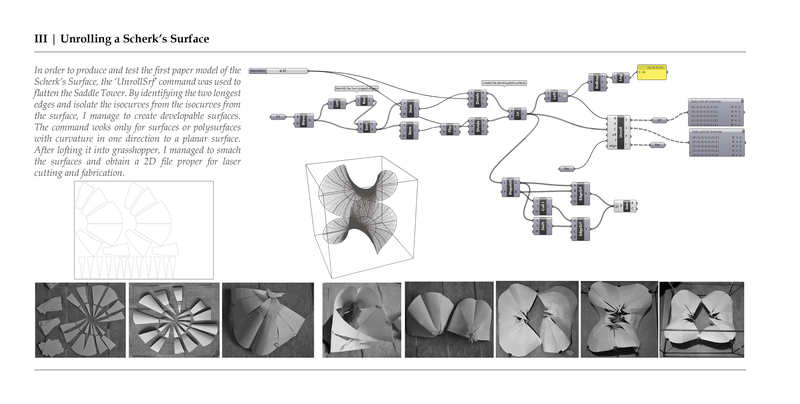 The above diagrams show Triply Periodic Minimal surfaces generated from their implicit mathematical equations. The functions are plotted with a domain of negative and positive Pi. By adjusting the domain to 0.5, the surface patch can be generated. Many TPMS can best be understood and constructed in terms of fundamental regions (or surface patches) bounded by mirror symmetry planes. For example, the fundamental region formed in the kaleidoscopic cell of a Schwarz P surface is a quadrilateral in a tetrahedron, which 1 /48 of a cube (shown below left). Four of which create the surface patch. 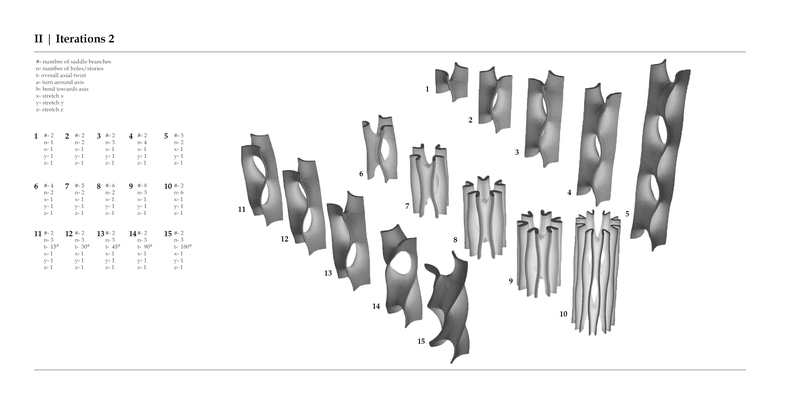 The right image shows a cubic unit cell, comprising eight of the surface patch. Schoen’s batwing surface has the quadrilateral tetrahedron (1/48 of a cube) as it’s kaleidoscopic cell, with a C2 symmetry axis. As shown in the evolution diagram below, the appearance of two fundamental regions is the source of the name ‘batwing’. Twelve of the fundamental regions form the cubic unit cell; however this is still only 1/8 of the complete minimal surface lattice cell. 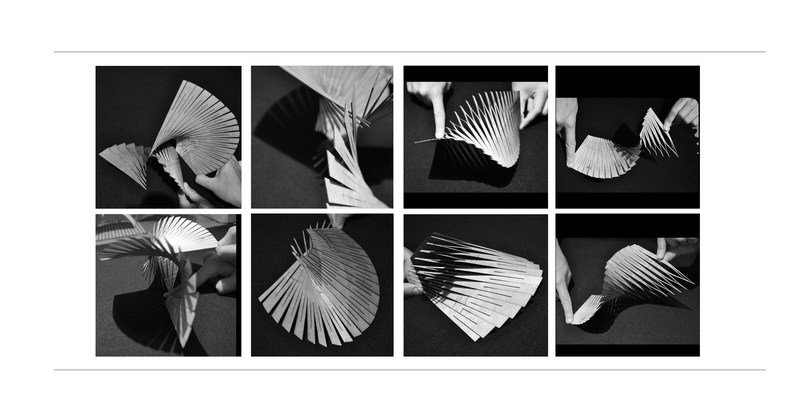 An exploration of the simplest Hyperbolic Paraboloidic ‘saddle’ form has lead to the development of a modular system that combines the principles of the hypar (Hyperbolic Paraboloid) and elastic potential energy. The physical manifestation of the above equations can be achieved by constructing a square and forcing the surface area to minimalise by introducing cross bracing that has shorter lengths than the square edges. A particular square hypar defined by b = n * √2 (b=boundary, n=initial geometry or ‘cross bracing’) thus constricting the four points to the corners of a cube leads to interesting tessellations in three dimensions. 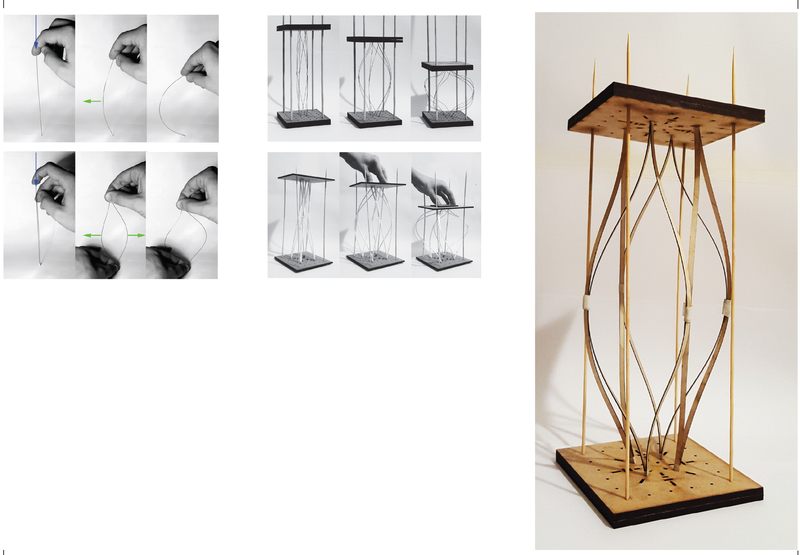 Using a simple elastic lashing system to construct a hypar module binds all intersections together whilst allowing rotational movement. The rotational movement at any given intersection is proportionally distributed to all others. 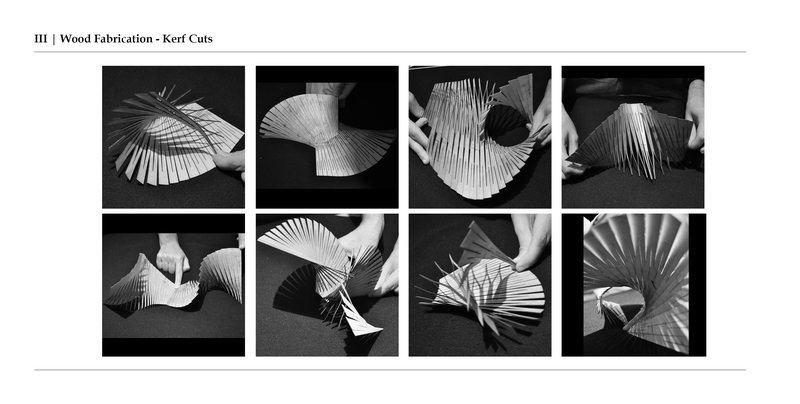 This combined with the elasticity of the joints means that the module has elastic potential energy (spring-like properties) therefore an array of many modules can adopt the same elastic properties. 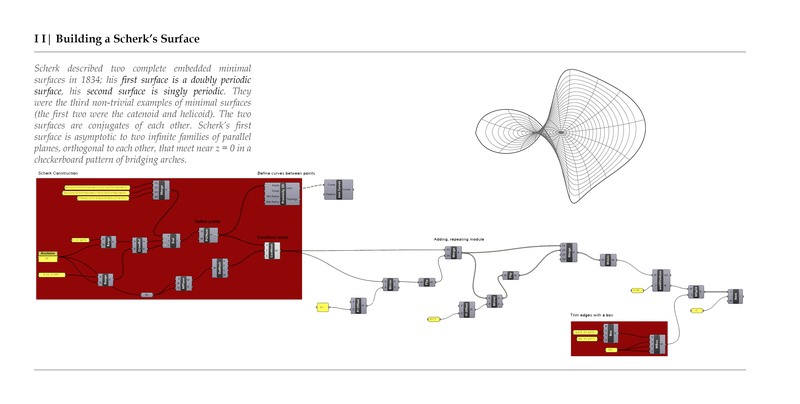 The system can be scaled, shaped, locked and adapted to suit programmatic requirements. In mathematics, a Scherk surface (named after Heinrich Scherk in 1834) is an example of a minimal surface. 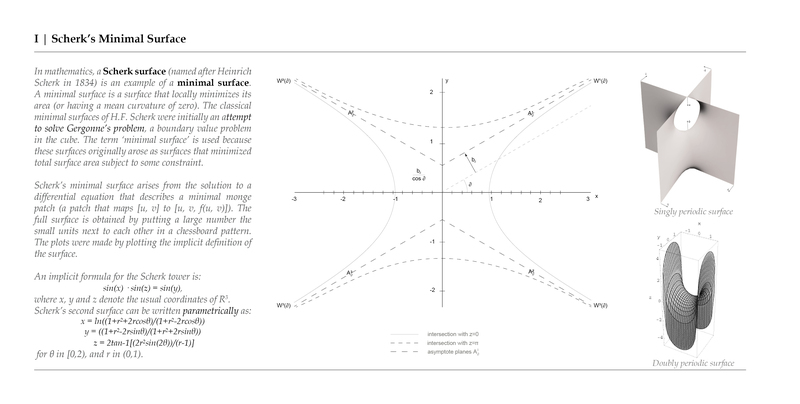 A minimal surface is a surface that locally minimizes its area (or having a mean curvature of zero). 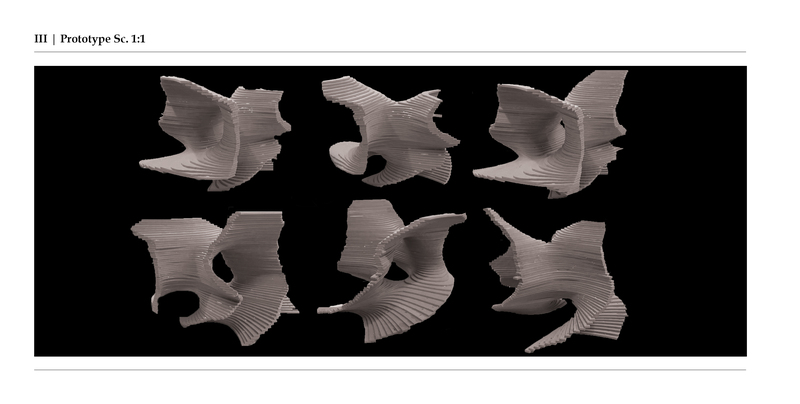 The classical minimal surfaces of H.F. Scherk were initially an attempt to solve Gergonne’s problem, a boundary value problem in the cube. 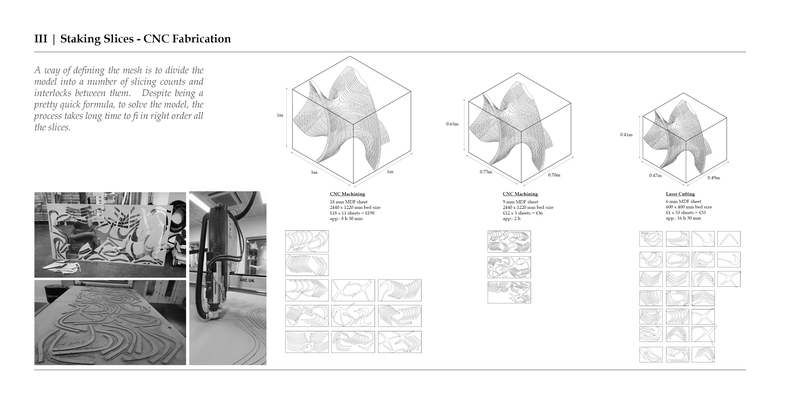 The term ‘minimal surface’ is used because these surfaces originally arose as surfaces that minimized total surface area subject to some constraint. 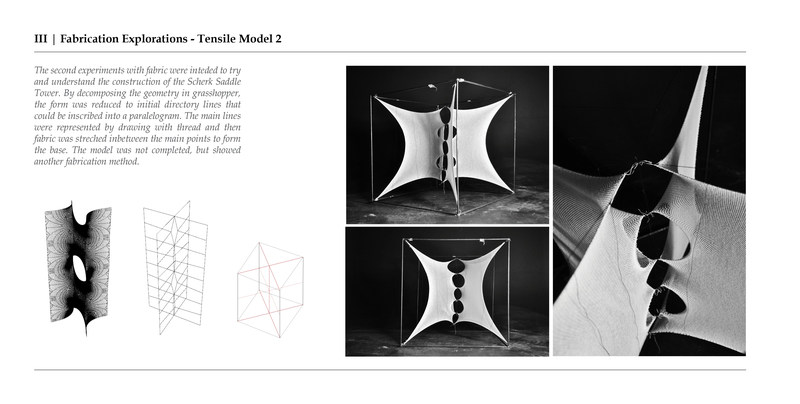 Physical models of area-minimizing minimal surfaces can be made by dipping a wire frame into a soap solution, forming a soap film, which is a minimal surface whose boundary is the wire frame. 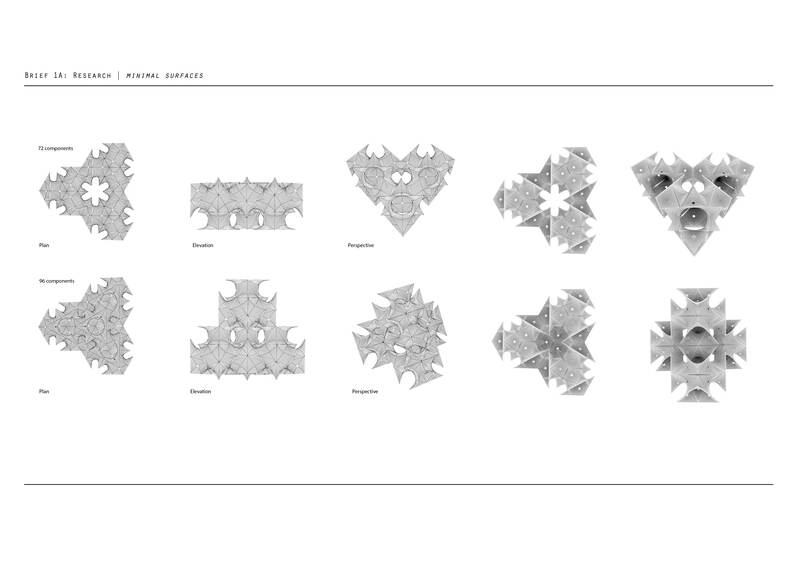 However the term is used for more general surfaces that may self-intersect or do not have constraints. 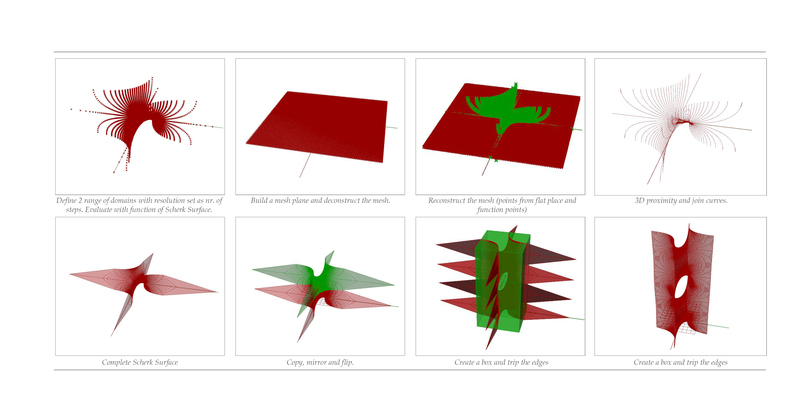 For a given constraint there may also exist several minimal surfaces with different areas (for example, minimal surface of revolution, Saddle Towers etc.). Scherk’s minimal surface arises from the solution to a differential equation that describes a minimal monge patch (a patch that maps [u, v] to [u, v, f(u, v)]). The full surface is obtained by putting a large number the small units next to each other in a chessboard pattern. 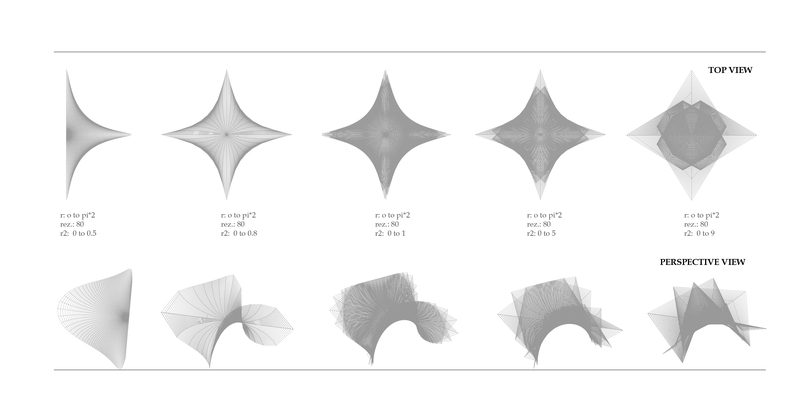 The plots were made by plotting the implicit definition of the surface. where x, y and z denote the usual coordinates of R3. for θ in [0,2), and r in (0,1). 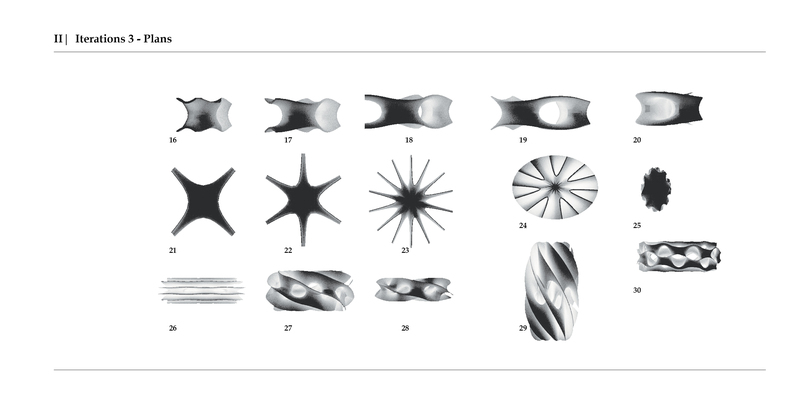 Scherk described two complete embedded minimal surfaces in 1834; his first surface is a doubly periodic surface, his second surface is singly periodic. 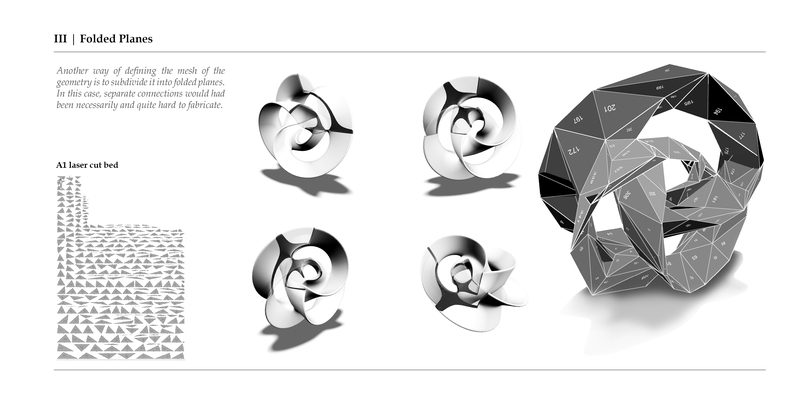 They were the third non-trivial examples of minimal surfaces (the first two were the catenoid and helicoid). The two surfaces are conjugates of each other. Scherk’s first surface is asymptotic to two infinite families of parallel planes, orthogonal to each other, that meet near z = 0 in a checkerboard pattern of bridging arches. It contains an infinite number of straight vertical lines. 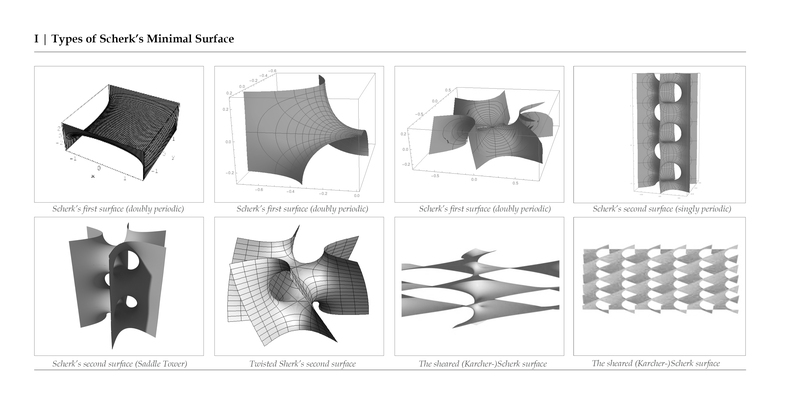 Scherk’s second surface looks globally like two orthogonal planes whose intersection consists of a sequence of tunnels in alternating directions. Its intersections with horizontal planes consists of alternating hyperbolas. 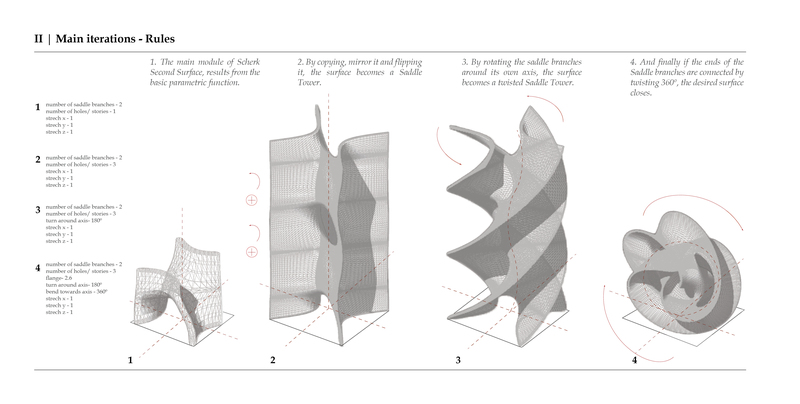 Scherk’s Surface can be adapted to several design possibilities, with multiple ways of fabrication. 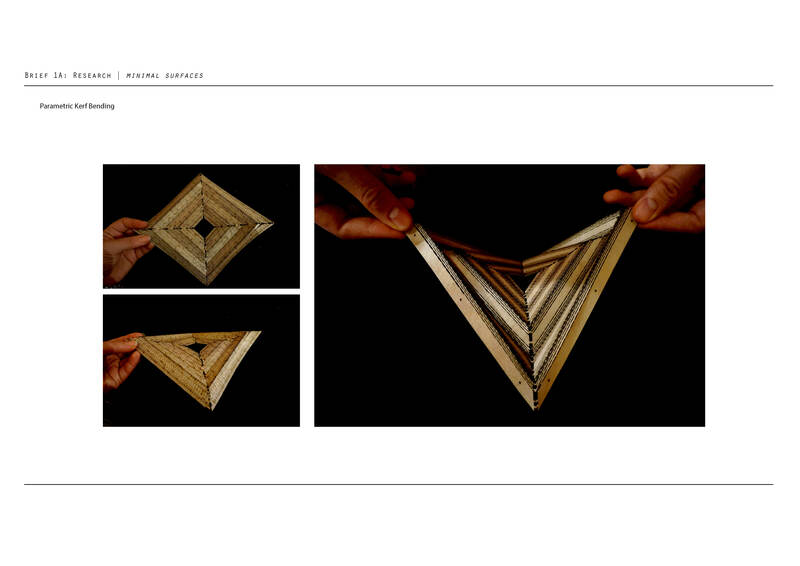 Interlocked slices using laser cut plywood sheets, folded planes of metal or CNC stacked wooden slices. 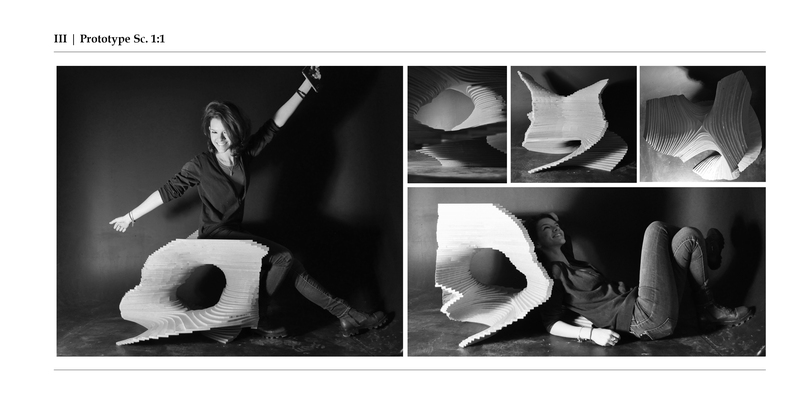 With its versatile and flexible form it is adaptable to any interior space as an installation or temporary furniture. 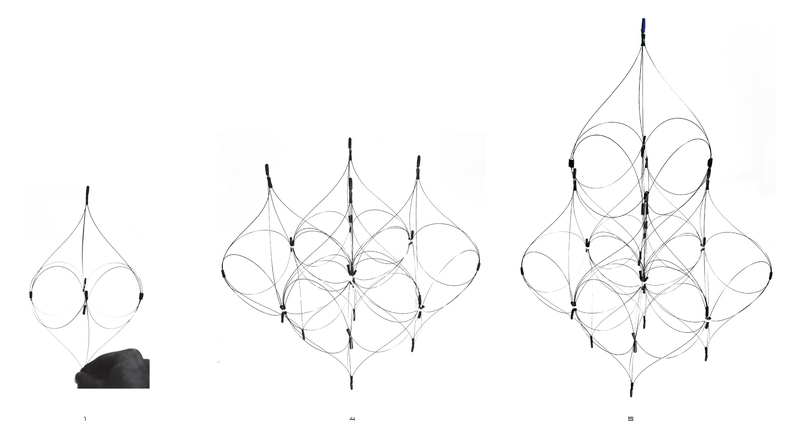 Minimal surface is an area minimizing surface whose mean curvature at any point is zero, and is often represented by the shapes of soap bubbles that span wire frames. 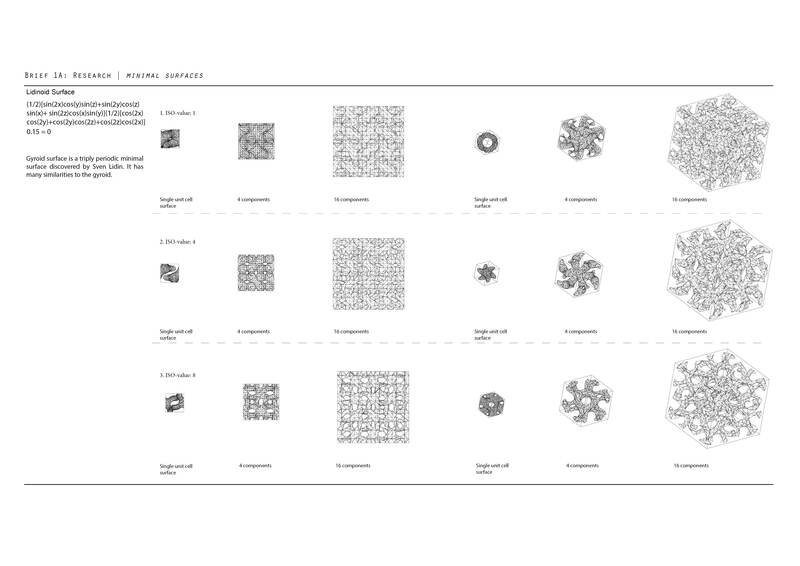 Some minimal surfaces have crystalline structures that repeat themselves periodically in three dimensions. 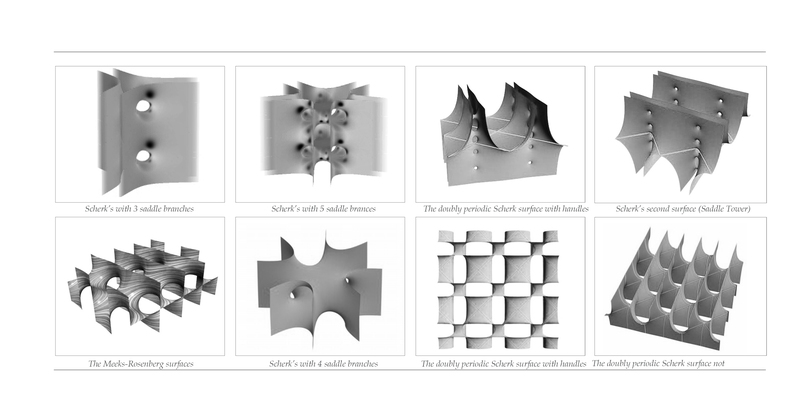 Many of these surfaces were discovered by Alan Schoen who analysed them in his technical report, ‘Infinite Periodic Minimal Surfaces without Self-Intersection‘, written in 1970. 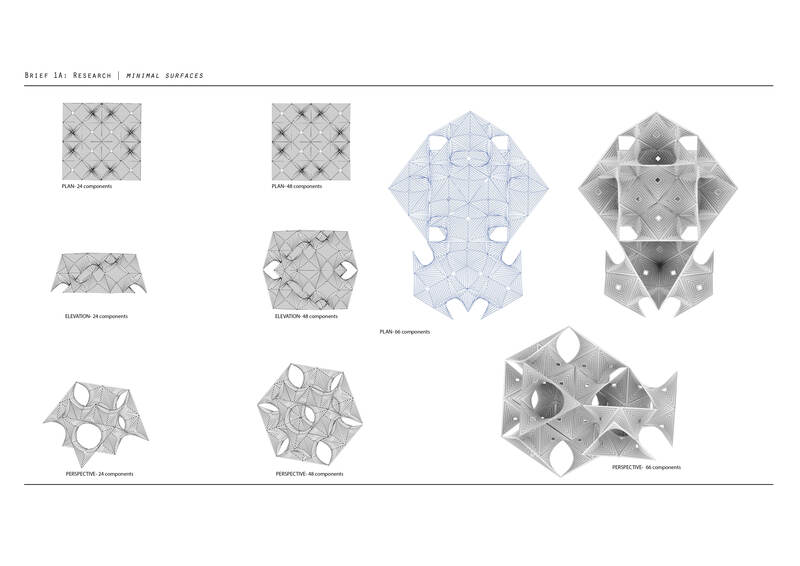 I first started researching the different types of triply periodic minimal surfaces to understand the rules behind their structures. 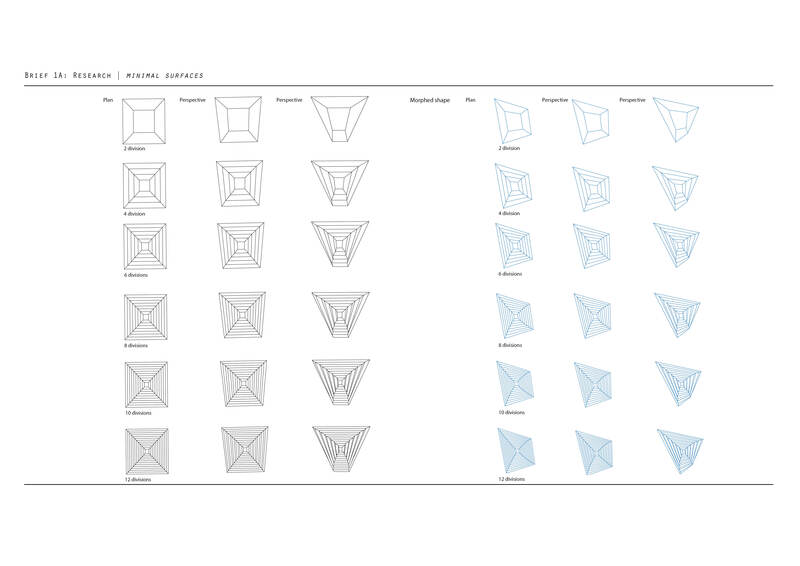 I have also been investigating different types of lattice hinges or cutting patterns that could help fold a hyperbolic paraboloid from a rigid single sheet material. These are photos from my trip to Munich Olympic Stadium, designed by Günter Behnisch and Frei Otto for the 1972 Olympic Games. The trip included a walk up over the top of the lightweight cable-net roof structure of the main stadium. The main drivers for the design of the event spaces were the desire to have a ‘green’ games, a compact games, and use the notion of transparency and light. The green element of the games is manifested in the fact that the stadium and other events spaces were set in a large expanse of newly created parkland [the site was previously an airfield related to the adjacent BMW factory]. The compact element came through in that the athletes were able to walk from their accommodation to all events except sailing. -The fact that the 1972 Olympics were the first to be broadcast using colour TV cameras, which took 8 seconds to adjust from shooting in sunlight to shooting in shade. The transparent roof of the stadium minimised the contrast between shaded and non-shaded areas, allowing continuous filming as the cameras panned around. The structure itself is based on a cable net pulled into shape by cables attached to large hollow steel columns. These columns take so much compressive force that they have to rest on 35m deep concrete foundations. 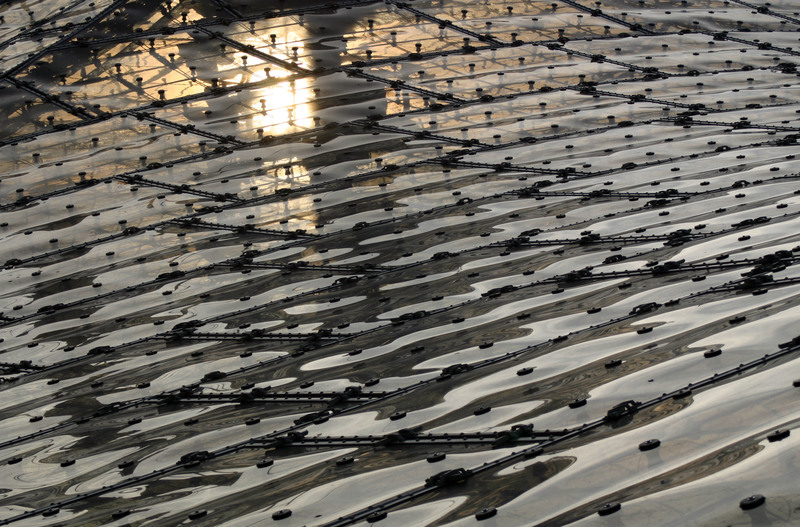 Protection from rain is the primary function of the roof over the stadium, and for this purpose it is covered in 4mm plexi-glass sheets. As shown in the photos below, these are attached directly to the cable net grid by flexible neoprene connectors about 100mm long. The sheets are clamped along their edges to neoprene strips which create 100mm wide flexible movement joints connecting them to each other. The plexi-glass sheets currently in use were put in during a refurbishment in 1994-99, and were taken up to the roof as 3m x 3m sheets which were then cut to size in-situ. The thinness of the plexi-glass combined with the flexible movement joints allow the cladding to move as the structure moves with wind, snow and thermal expansion loading. The steel columns rest on rubber lined ball and socket joints, allowing them to move freely in every direction. The tops of the columns can move by up to around 1m with large snow loading. A demonstration of the flexible tensile nature of the roof came when we were told to jump up and down on the walkway running over it – the whole roof behaved like a trampoline, deflecting about 200-300mm vertically as we jumped. The swimming pool is the only enclosed building that I photographed the interior of. Also on the site is the indoor arena. 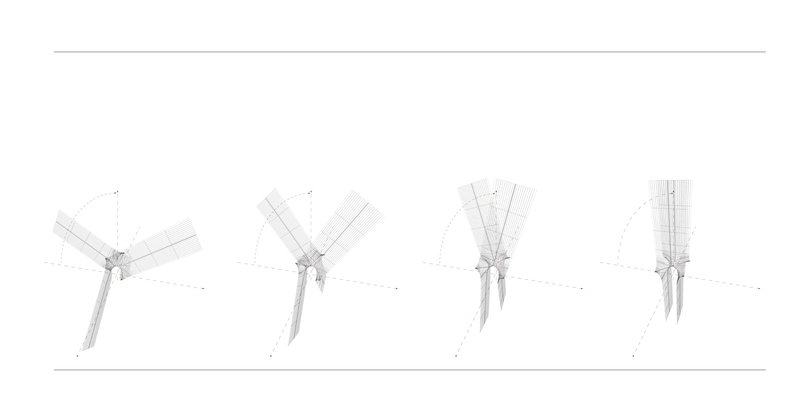 The interior space is defined by a tensile membrane that hangs about 1m below the cable net. The walls are made from curtain walling supported by exterior space-frames. 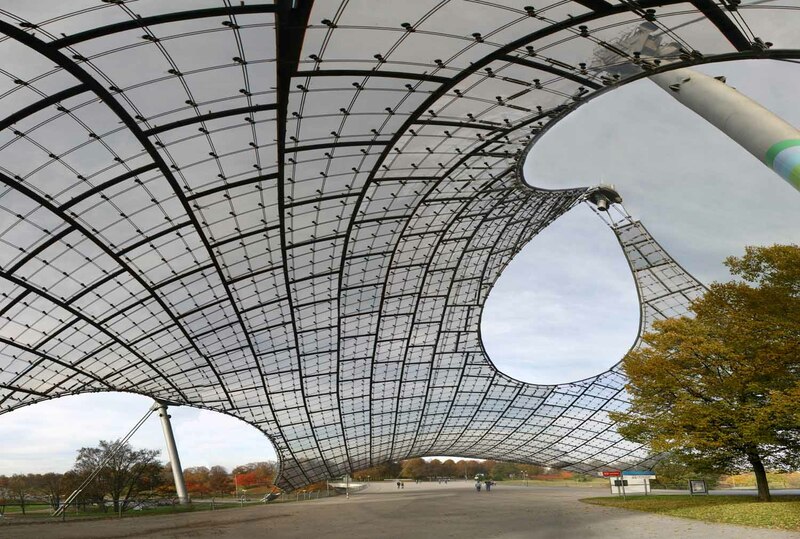 The connection between the membrane roof and the curtain walling needs to be flexible enough to take up the movement of the cable net, and is provided by an ETFE cushion.